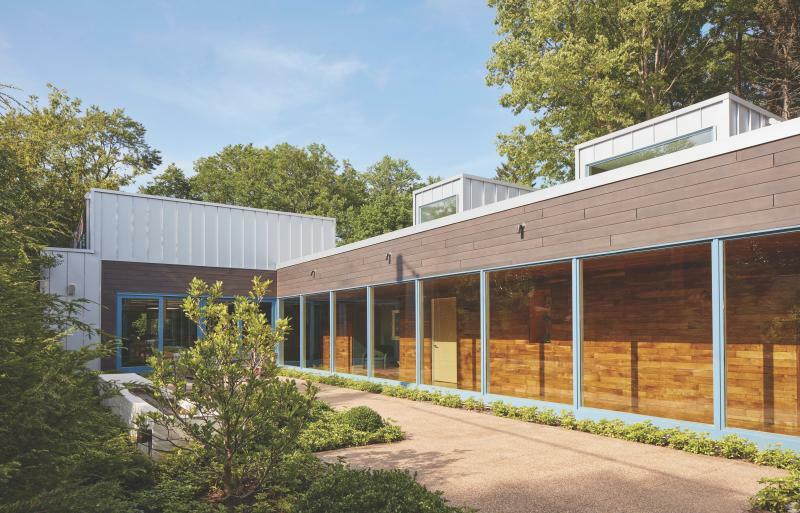 The rectilinear forms and broad expanses of glass that define the Courtyard Residence , in Downers Grove, Ill., don’t just appeal to the homeowners’ design tastes; they’re part of a functional sensibility essential to the well-being of their family. Among the family members are two children with limited mobility, for whom the homeowners sought to create a space that would not only accommodate their needs today, but which would be ideal for them to live out their lives. 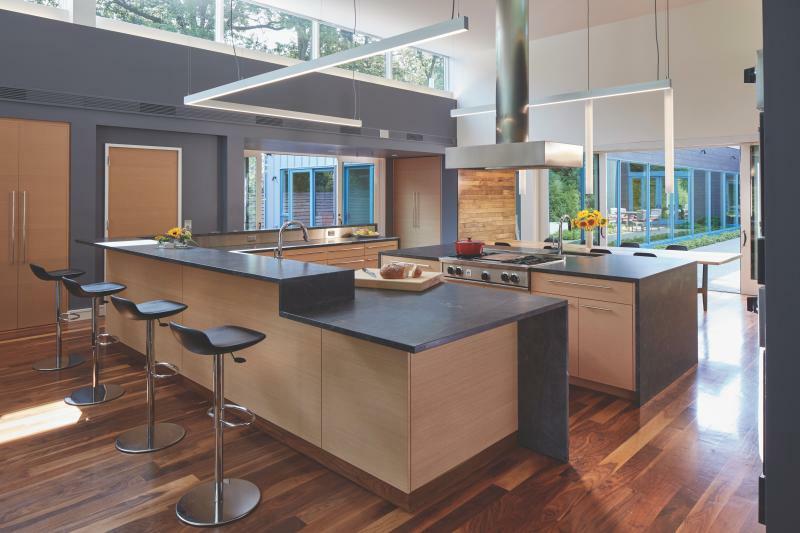 Along with the features one expects in a home accessible to wheelchairs, the layout itself was designed with the girls’ health in mind, ensuring ample connections to the outdoors and abundant natural light. Traditionally, the narrow lot likely would have had a two-story house with a large backyard; instead, the architect spread a single-story footprint across much of the property, with three courtyards pushing in from the sides and integrating with nearly every room via windows and doors. Clerestory windows further those connections while bringing in even more light from above. As a result, light animates the rooms throughout the day. “It’s really a kaleidoscopic array of experiences that the planning of the house made possible,” Rappe explains. He says Marvin windows topped his list because they offered an ideal balance between performance and cost, as well as narrow sight lines and high insulation values. The team used awning and casement windows from Marvin’s clad-wood Ultimate line, and sliding and swinging French doors. Along a 60-foot-long hall, called the “cloister,” nine Marvin direct-set floor-to-ceiling windows connect the interior to the adjacent courtyard. Rappe worked with Rob Jackman, senior product manager at Searls Windows and Doors, to maximize the unit size using custom steel mullion reinforcement concealed by narrow mullion covers and frame expanders. GENERAL CONTRACTOR / Roberts Design & Build, Downers Grove, Ill. This story originally appeared in the May/June 2018 issue of PRODUCTS magazine. See the print version here.